Illegal accesses may cause problems in the field. Additionally, license or liability issues can arise. ValueAnalyzer provides the solution to these problems. It statically analyzes object code and reports any violation of your spec. A common principle in embedded control software is that global data structures like (function-)pointer variables are initialized in separate code sections. Consequently, when a task or runnable is analyzed for its worst-case timing or stack usage, these initializations are unknown. This usually leads to a less precise analysis with more manual annotations. With ValueAnalyzer you can automatically collect initialization data for global variables and feed it as auto-generated annotations to a WCET, stack-usage, or yet another value analysis. Modern development standards such as DO-178B require unreachable code to be eliminated. Since the required testing effort is high, it is desirable to remove unreachable code as early as possible. ValueAnalyzer automatically identifies code that is provably unreachable during any program execution. Interactive, easily explorable analysis results. 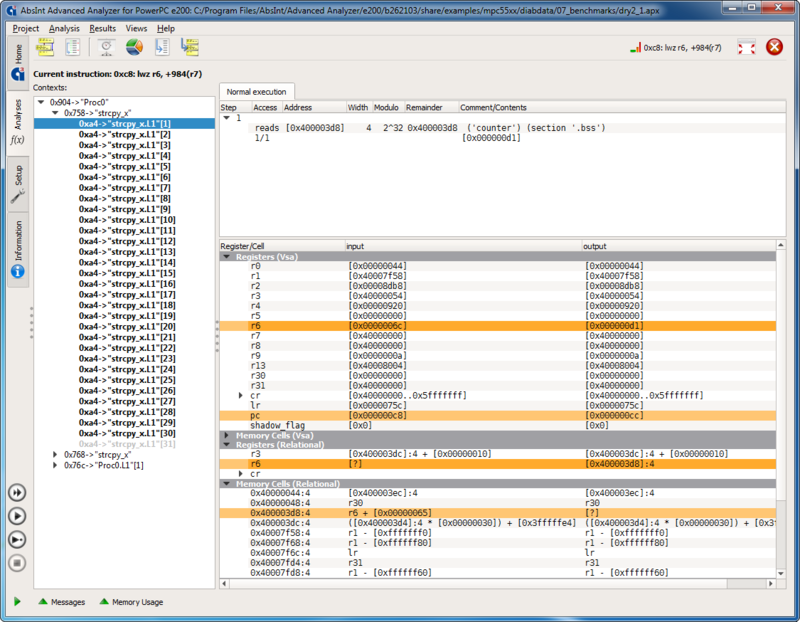 Contents of registers and memory cells are shown before and after instruction execution per context. Detection of unreachable code. Code reported as unreachable is guaranteed to be unreach­able for all possible inputs and each program execution under any circumstances. Seamless integration with StackAnalyzer, aiT WCET Analyzer, and/or TimingProfiler in a single intuitive user interface. Plugin for Jenkins, the leading open-source automation server. The analysis is fully automatic and valid for all inputs. No input patterns need to be provided. The analysis is conservative, i.e. the results are safe. All illegal accesses that are present will also be reported. Supplied third-party software can be analyzed right away. It does not have to be integrated on the ECU. No debug information is required. The results are not affected by possible bugs in the debug output. 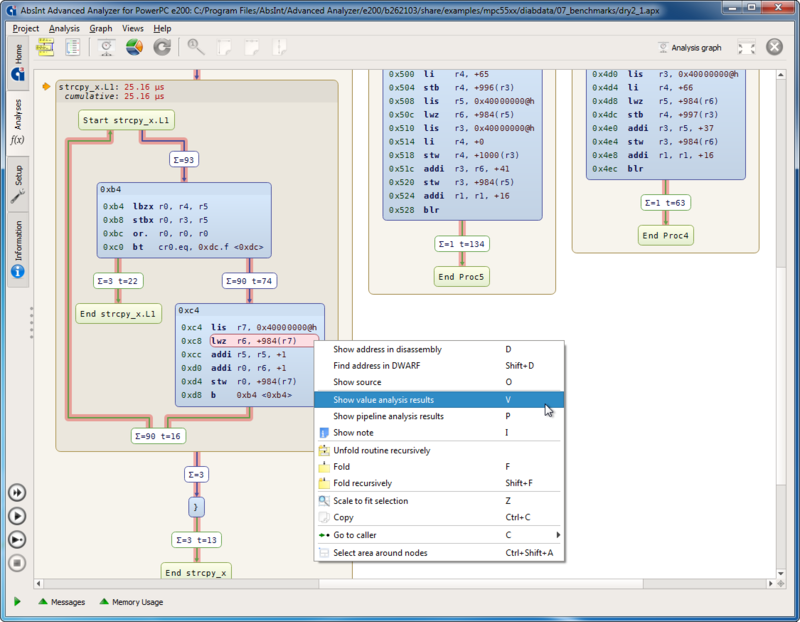 ValueAnalyzer is available as an add-on to aiT, StackAnalyzer, and TimingProfiler, for all processor–compiler combinations supported by these tools.